What you need to know about becoming a resident in the state of Delaware and establishing your residency. 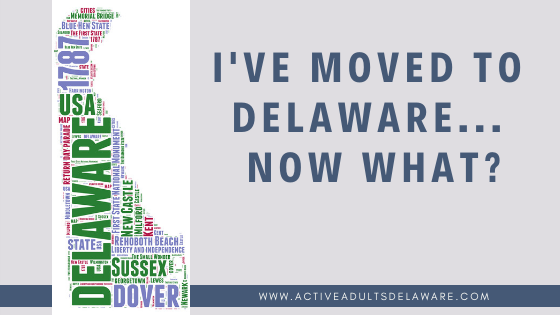 I’m moving to Delaware, now what? Ron had this question about establishing residency in Delaware, “Do you have a package on where and how to accomplish everything?” They want to get their driver’s licenses and register to vote, etc. As I have often said, I get the best ideas from our clients! I have posted articles and videos on many aspects of relocating and moving to a new state, but what a good idea, Ron, to pull it all together in one neat package, so here we go. You must apply for and receive a Delaware driver’s license within 60 days of becoming a Delaware resident. TIP #1 – When you obtain your Delaware driver’s license, you may also register to vote and/or become an organ donor at one of the DMV offices in Wilmington, Delaware City, Dover, or Georgetown. You’ll be very impressed with the DMV facilities, especially the one in Georgetown. The change since I moved to Sussex County in 2003 is dramatic. What was once a trailer with lines out the door and around the parking lot, is now a modern, efficient system—with minimal wait times. You will be required to pass an eye test. The knowledge test and the road test may be waived if you hold a valid driver’s license from another state. New residents should be prepared to provide one proof of identity, one proof of legal presence, two proofs of Delaware residence, proof of Social Security Number, and if applicable, proof of legal name change(s). For a complete list of acceptable documents, please visit www.dmv.de.gov and search under “general requirements”. Delaware state law requires changes of address to be reported to the Division of Motor Vehicles within 30 days. New residents must title and register their vehicle(s) within 60 days. You need to purchase liability insurance from a company licensed to operate in the state of Delaware which provides at least the minimum coverage. Have your vehicle inspected. Review the checklist on the DMV website to be sure you have everything to avoid multiple trips! Apply for a Delaware title and registration. For detailed information on the process of obtaining a Delaware driver’s license, please visit https://delaware.gov/topics/relocate.shtml and click on the link named New Resident Licensing and Registration. What about buying a new car? Ron remembered that I had done a video or written an article on the topic of transferring an older car. TIP #3 – Determining if you should transfer an older car or purchase new once you’re in Delaware. Here is a link to that article and video Should I Buy a Car Before Or After I Relocate to Delaware? Whether the car is new or used, you will pay a one-time Doc fee of 4.25% of the NADA value when you register the car in Delaware. If, after you have moved to Delaware, you purchase a new car and trade in the old one, the trade-in value will be credited and will reduce the amount of document fee paid when titling the new vehicle. For more details, please refer to Vehicle Services on the DMV website. Other than hiring the moving company and getting settled into your new home, this pretty much covers the essential things you must do to become a Delawarean. Then comes the fun part—get out and Get Local! Now that you are official, please be sure to sign up for our Locals NOW email newsletter to learn about area events, our favorite Delaware businesses and so much more!